Hello Dr. Hahn, I'm so glad you contracted us regarding our work at Delaware Town and environs. We have been using the web site that you edit for a skeleton of historic background. The main reason that we think that archaeological investigations at Anderson's Village )or Delaware Town) is important is that there is so little documentation of the decade from 1820-1830. We have been taking field schools to the James River for 4 years in search of the village, and have explored and documented other 1820s sites, such as the former location of the Wilson trading post. In 2003 we gained access to a field that we thought had high potential. And we were right! We have thus far located a single house location and excavated a large, interior storage/trash pit. This pit was full of artifacts diagnostic of the 1820s and of the Lenape themselves. Among te artifacts are ceramic shards typical of the 1820s, gunflints, lead bullets and scraps, brass tinkle cones and possible arrow tips, glass beads, silver brooches, animal bones, and a few household items, like nails, glass, and knife fragments. During the summer of 2004, the first week of field school was spent searching for Marshall's trading post near the confluence of the Finley and James Rivers. We used Marshall's probate to try to locate his trading post and distillery. What we found were farms where the ground had been moved and moved and moved again during the 170 years, making the early historical period very difficult to detect. Additonal research is in order before more fieldwork is done. . . . This 1825 Map of Missouri originally produced by Jonathan Sheppard Books shows the presence of the Delaware in the southwest corner, with the Kickapoo to the north and the Shawnee to the east. The White River is just north of the Arkansas Territory border. (From "Delaware Towns: A Trader's Emporium and a Last Rendezvous"
The Upper White River settlements during the 1920s was a conglomeration of: French, English. and Scotch-Irish traders and hunters, numerous nationals of Delaware, Shawnee, Kickapoo, Cherokee, Piankeshaw, Peoria, and other origins, half-breed peoples interspersed throughout, black slaves of traders and free blacks among Indian groups, and white squatters on Federal lands and on Indian claims. *Interpreters, clerks boatmen. freighters, blacksmiths, stockmen, and agriculturalists were included among the laborers. Even the trade invoices reflect the cultural diversity among the Delawares as merchandise was separated according to "Emigrating Indians" and "Civilized Indians." The largest entrepot for the dissemination of trade goods was the Gilliss Trading Post on the Upper James River. The Federal annuities allowed by treaty to the Delaware and other Indians were administered through the Superintendent of Indian Affairs, St. Louis. Richard Graham, one of General William Clark's subagents, was responsible for the upper White River tribes during the 1820s. Through other subagents such as Col. Pierre Menard of Kaskaskia-Ste. Genevieve and resident subagents among the tribes such as John Campbell on James River, the federal monies were distributed. Louis Lorimer had functioned as the primary Ozarks Delaware and Shawnee protector and patron from the 1780s until his death on the eve of the War of 1812. In his will he named his "trusty friends Jean Baptiste Valle and St. Gemme Beauvais of Ste. Genevieve" as guardians of his underage children (Lorimer ca. 1811) Lorimer and Valle for many years had a successful mercantile among the Apple Creek settlements. Therefore, with the death of Lorimer, William Clark asked and received permission for the appointment of Pierre Menard as subagent for the Delaware and Shawnee (Carter 1949:632-633 and 651). At some time during the 1810s Louis Lorimer, Jr., a West Point graduate and veteran of travels on the Missouri River to Ft. Osage, continued his father's trading interests among the Delaware. Lorimer, Jr., built a trading post at the mouth of Swan Creek which William Gilliss bought in 1822 (see Morrow 1981: 147-167 for Gilliss background). It is also possible Peter A. Lorimer may have been at Swan Creek. Through Menard and Vale, William Gilliss traded with the Delawares and realized his own personal fortune - one that in essence was financed by the $4,000 perpetual annuity awarded them by the St. Mary's treaty of 1818. Gilliss' success was also due to his personal relations with William Anderson, head chief of the Delaware. and his diplomatic cohabitation with Indian women. The Richard Graham Papers do not suggest much hostility among the James River traders. 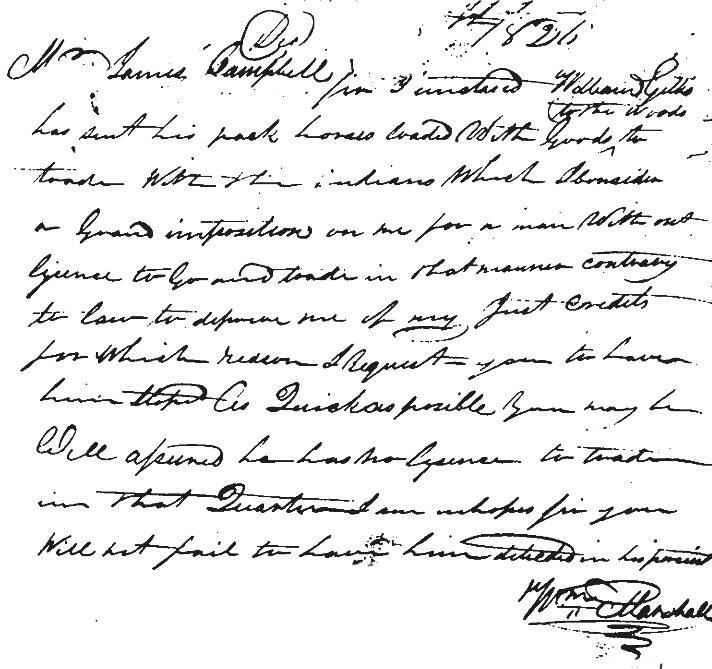 L=Licensed traders such as William Marshall, who also was supplied by Menard an Valle, did complain to Graham when he knew Gilliss or others had not complied with the regulations. But on the whole a virtual trading monopoly did not seem to exist. It was tied to Ste. Genevieve families, with Menard and Valle having the most influence. Apparently a major reason for unhindered profits made at the Delaware towns was that Menard and Valle established reciprocal trading agreements with John Jacob Astor. By the Spring of 1823 new Delaware being established on the James River reflected the ever-increasing national arrivals of the tribe. At this time Astor bought out Stone, Bostwick & Company who were primary consumers of the Mississippi Valley trade. Peripheral arrangements included an association with Menard and Valle "who had ties with traders working throughout southern Missouri unto Arkansas and what is now eastern Oklahoma." (Lavendar 1964:341) Menard and Valle were to buy their merchandise from the American Fur Company and, in turn Astor was given the first right to buy their furs. (Terrell `963:370) While this arrangement was practiced in the mid-1920s Menard and Valle had the advantage of the majority of the Delaware Nation assembled in one general locale long the James River. found with a little practice he will make a first rate interpreter. He speaks the English language very well and has come to speak the Delaware language well so says the Indians. He is now with me reading and writing. I think that him and Troit together would answer all our purposes well as to the interpreting (Graham Papers September 27, 1825). When traders applied for licenses in the upper White River country and wanted trade with more than one tribe, they had to be established at Anderson's Town (Graham Papers April 9, 1825). Campbell wanted the Superintendency to construct Federal buildings on the James "opposite Anderson's dwelling . . . built on the pan of Wilson's buildings. " Anderson's house was located near a "fine spring and good timber." Campbell found it" disagreeable to board w9ith those people" but in an official capacity he apparently visited all the Delaware cabins (Graham Papers July 25,, 1825). Lack of material amenities naturally disturbed Campbell and he implored Graham "not to forget to send tea. his hat, trunk and mattress by Wilson (Graham Papers May 19, 1825). . .
For the most part Campbell was the primary law officer in Southwest Missouri during the 1820s. Even at that he was not sure of his own jurisdiction, and he asked for clarification when criminal actions were brought to his attention. Apparently Indian posses were at his disposal should he decide to use them. . On the James River, Agent Campbell struggled with numerous thefts of stock among Indians and Whites and the ever-present problem of illegal whiskey. . .
Epilogue: . . . During the 1830s a few Delaware apparently remained in the Missouri and Arkansas Ozarks. Most of them went on to Kansas, Oklahoma, and Texas. Delaware and Osage tribesmen visited their 0ld homes in Southwest Missouri until 1845, according to Statistics of the Population of Greene County, 1876:18. . . . Glliss of course continued his Indian commerce on the border of the Missouri and Kansas reservations. He lived in a log house until he built his stone mansion and became and almost mythical person around Kansas City long years after his death. Joseph Philibert stayed in the same area as Gilliss for two years, investing land there and in St. Louis. He returned to White River country. established a large farm at the mouth of he James River, and became a well-known pioneer in modern Stone County. James Wilson, interpreter and trader on James River, reputedly named the town of Springfield for his home town of Springfield, Massachusetts. . . . Wilson was fired as interpreter by Campbell for improper dealings with the Delaware. Although Wilson lived with the Delaware women he was accused of stealing their iron and swindling the Indians of their money. Before his death ca. 1835 he went to St. Louis for a French bride, and returned to Wilson Creek. . . . But the most locally significant principal of Delaware Towns background in this regard was trader William Marshall. Marshall's death in 1833 produced a two=year probate litigation as the Greene County Court sought to administer his some $12,000 estate including two slaves. Over-half was awarded to the Menard-Valle Company of St. Genevieve, but accounts payable and accounts receivable among Greene County pioneers was lengthy. Marshall, who had moved to Ingle's old mill downstream to the mouth of Finley where he had a Plantation," ran this small industry and was also a "banker" for numerous people by providing cash and services credit (History of Green County 1883: 131-132) . . .
Of the above four Indian traders who all came together at Kaskaskia-Ste. Genevieve and were involved in the Delaware Towns Indian trade, only Gilliss did not live out his life in the James River area. Gillis removed with the annuities [to the Delaware]. Perhaps the others regretted the Delaware removal as they pondered the beneficial effect to the local economy and improvements that annuities as transfer payments had produced. Marshall, Philibert, and Wilson all three, by virtue of the "annuity trade," became early influential citizens of Greene County. From 1820 to 1830, when the first white settlers came into the region that now comprises Christian County, the only settlement of any consequence in the entire area that is now southwest Missouri was Delaware Town. It consisted of the James Fork Trading Post (named so because it was situated on the James Fork of the White River), several homes, a warehouse, a building where cheese was made (all these structures were made of logs), several hen houses and corn cribs, the many lodges of the Delaware Indians who resided in the village of the principal chief of the tribe, Captain William Anderson, and a large horse-racing track where the Delawares raced their mounts and wagered on the outcome. ...by 1818, the advancing tide of settlers forced them to sign another treaty which would locate them on new lands in what is now Christian County. In return the US government agreed to pay the tribe an annual annuity in silver totaling $4000, give them 120 horses, and provide them with [a[ government-employed blacksmith. Thirteen hundred and forty-six Delawares and their fourteen hundred horses were ferried across the Mississippi River in the summer of 1820 to take up residence on the new lands, which had been chosen for them by General William Clark of Lewis & Clark fame. Other villages strung out along the banks of the James River were those of Captain Ketchum (Whose Lenape name was Tah-whee-lalen), Capt. Pipe (who was of the wolf clan), Capt. Patterson (Meshe Kowhay), Capt. Beaver (who was of the turkey clan), Natcoming and Suwaunock (Chief Anderson's son). The whites in the Delaware Town area at this time were William Gilliss (who owned the trading post and also had one on the banks of Swan Creek near what is now Forsyth), Joseph Philibert (who worked for Gilliss a the James Fork Trading Post), William Myres (who clerked for Gilliss at the Swan Creek Trading Post), James and Phoebe Pool (he was the government-paid blacksmith for the Delawares), Richard Graham (Indian Agent), John Campbell (Indian sub-agent), William Marshall (a competing trader who also built a crude mill on the Finley River near its mouth), James Wilson (competing trader who was located on the banks of the creek that would come to bear his name) and Solomon Yokum )who was ordered off the reservation by Campbell for selling whiskey to the Delawares). There were also several slaves belonging to Gilliss who served as cooks and cheese makers. In addition, Baptiste Peoria, who was part Indian and part African, served as an interpreter and guide for Gilliss. The Delawares used their annual annuity from the government, paid in silver (one theory has it that Solomon Yokum, after being kicked off the reservation, melted down this silver specie to form his own Yokum dollars in order to hide the fact that he was still selling whiskey to the Indians) to purchase trade goods. By the time they had come to Delaware Town, they had adopted many of the European ways of living, In addition to breechcloths, they wore white men's clothing, used metal tools an d hunted with rifles. While some lived in the traditional rounded lodges made from tree limbs, brush, cedar boughs and animal hides, others resided in log cabins, with a dirt floor and a hole in the of to allow smoke from the cook-fire to escape. We arrived at Springfield on Wednesday 16th day of September [year date not presently known]. This is a Poor Race [sic] & the country is indifferent that surrounds it. There are some 8 or 10 log- cabins which form the place. There are 3 or 4 Stores 2 groceries, 2 Black-Smith shops & one Tan-yard. This is the first pace that I ever Knew of a Post Office being kept in a grocery. The Post office of this Place is the first After we left Boonville. We staid in this Place one night & part of a one day. We were entertained by T. Campbell the Tavern keeper. His Table was Tollerably well furnished, as well I presume as the country affords. . .
Twelve o clock when we started for a stand 12 miles distant known by the name of the: Delaware towns: This place was once an Indian village of considerable Strenght [sic], but it is now in a State [of] dilapidation therefore bears but few marks of former greatness. There is a Large creek (Wilson) running along the Side of this old Town. It is said, that the Idian [sic] Graves are seen for four or five miles on the Bank of this creek. We traveled on & passed the Line dividing Missouri from Arkansas Territory my [by] next day after we left the Indian Village. The Line is 34 miles from a small town in Arkansas Territory called Fayetteville. The country along here is very rich & Produces the best corn I ever saw. On the 21st September, we arrived at Fayetteville We were delayed here some hours, Reshoeing a Part of our horses. . . While conducting research in the Missouri Historical Society archives I discovered a document relevant to early American industries. It is an invoice of June 27, 1822 for tools provided as annuities to the Delaware Indians by the U.S. Indian Department on behalf of Major Richard Graham who was an Indian agent living in St. Louis, Missouri. Graham authorized the purchase of the tools from B. L. Valle who presumably delivered them to the Indians living at that time on the Current and Jacks Fork Rivers in the area now encompassed by Ozark National Scenic Riverways in the southeastern Ozarks of Missouri. The assemblage of tools represented by the list appears to constitute a kit of maintaining and repairing firearms. The list of entries for 11 categories of metalworking tools and 9 of woodworking tools, assuming the files were used only on metal. The metalworking tools would have allowed the Indians to shape, pierce, hold, cut, tap, and cut threads on gun parts. The woodworking tools were probably intended for use in repairing and making gunstocks. A hand saw was provided for cutting wood and chisels and gouges for bedding barrels and inletting locks and other parts. A jack plane, a smooth plane, and a round plane were probably intended for shaping and smoothing gunstocks after they were roughed out with the drawknife provided. The bitstock provided was probably intended for boring holes for the lock and escutcheon plate screws and for other piercing. The 300 pounds of iron included with the tools were probably for raw material for the manufacture of gun parts. Other contemporaneous documents indicate that most metal forging work was done by European blacksmiths for the Indians at the expense of the U.S. Indian Department. . . Received 27 June 1822 of Maj. R. Grahams by the hands of Col. P. Menard Ninety Nine Dollars and fifty Cents in full of the above acct. Miscellaneous Items of Correspondence (Mostly from Richard Graham Papers) A few items have been given emphasis by your editor. Sir, Your letter of the 7 June, enclosing an estimate for the quarter ending 3th Set. next, has been received. Funds for the 1st & 2nd Mos have long since been remitted to you, this Gov. Clark, which I presume you have received before this time. A remittance was also made directly to you on the 23 May last of $3341.66 on account of the expenses of the emigration of the Delaware, of which you were informed by letter of that date, and emigration of the Delaware, of which you were informed by letter of that date, and which I had hoped would be sufficient to cover all the expenses of the Delaware emigration as it was the entire balance remaining of the appropriation for that object. But as it appears from your estimate for the quarter ending the 30th Sept. next, that it will not be sufficient. I have deemed it advisable to authorize you to draw on Gov. Thos. A. Smith. the receiver at Franklin, Missouri, for $6021/the amt. pf your estimate, which I confidently expect will, with the sum before remitted, be amply sufficient to cover all expenses attending the emigration of the Delawares, and also of the Kickapoos, for the present year. The Honble the Secty of War in his letter of 23 April 1822 says, "you will exercize your discretion in furnishing provisions to the new Delaware Emigrants for a reasonable time. but it my opinion that the government is not bound to furnish any thing more than a due proportion of corn for support until they can raise it for themselves.". . .
Sir: The Secty of War informs me that you have been appointed under an act of Congress passed at the last Session Superintendant of Indian Affairs at St. Louis and by direction of the President your Superintendance will enha[n]ce the several Indian agencies on the Mississippi and Missouri & requires me to correspond with you in relation to my duties and take your instruction upon all points connected with them. Stating to me at the same time "the Delaware annuity to be $5500 of which $1200 have been remitted to Mr. Johnson to pay for horses furnished to the last immigrants, The $2000 due to the Kickapoo under the Treaty at Edwardsville and the private annuities of the Delaware chiefs Anderson & Lapanihilie [spelling?] & the an allowance to the Delawares in lieu of Salt, will be remitted as soon as an appropriation is made by Congress. I have not received the latter annuities & am now waiting for them before I proceed to distribute the others, as I do not wish to make two trips for their payment besides at this particular time all the Indians are out at their Summer hunt & will not return before 1 Aug. If therefore these annuities have been remitted to you, I would like to receive them at as early a date as possible. . . I herewith enclose you an estimate of expenses necessary in removing the Indians (Delaware & Kickapoo) to the Lands designated for them by Gov, this Estimate embraces the lowest possible amt. that can be expended for them with a view to keep them from starving. . .
Sir: . . . The Delaware & Shawnee will commence their movement this fall for their Lands. which I have selected agreeable to instructions from the Honble the Secty of War they are situated in S.W. 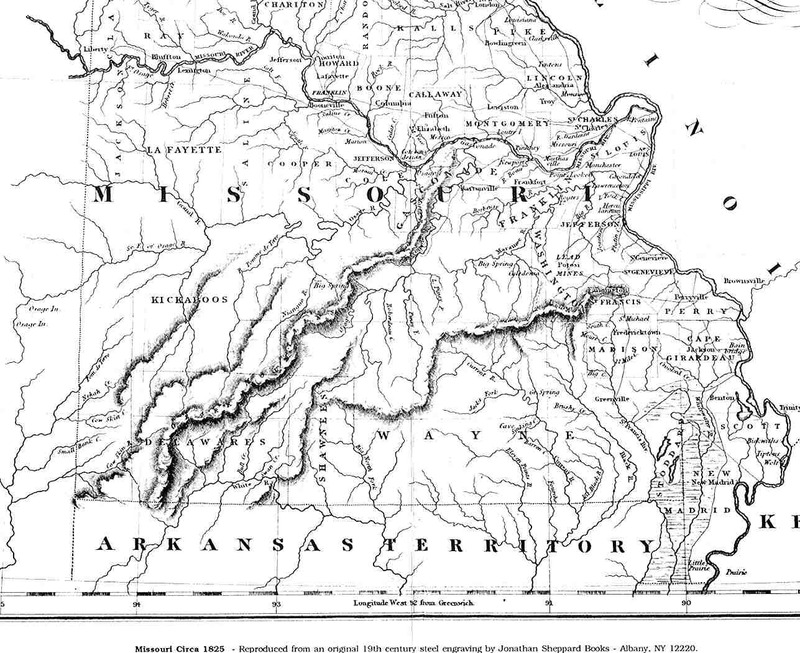 corner of the State Bounded by the Osage Boundary line on the W. tye Kickapoo Boundary on the NE & running from those lines to include such quantity of land as may be deemed advisable to grant to them, to include the Great Bend of White River at James Fork with a reservation of the lead mines (the Indians expect 70 miles square), The Cheifs of the Delaware are extremely anxious to have the extent of their lands finced, their boundaries run out at [as? [ marked, & the White people who are now settled on there removed as speedily as possible. I will have by leave to request the policy of ordering off as soon as practeable all the squatters on those lands designed for the Indians. Numbers of families have settled themselves on those lands neither this year past & many are moving from Boonslick County to settle in them. The Lead mines on White River are worked by White people under an old unconfirmed Spanish grant, it is said, of this grant I know nothing tho, am informed it is for 5 leagues square, if so & proved to be, a good claim, it will interfere with the lands to be granted to the Delawares. I found some difficulty in getting the Osage to agree to give up their Factory on Marie deCigne but when they found there was no treaty of obligation to continue the factory. they consented to yield . . . I am happy to inform you that a treaty of peace has been entered into between the Osages, Delawares & Shawnees & perfectly tranquility is restored to all the Indians within my agency. Respectfully. . . R Graham, U.S. Ind. Agt. Sir: Enclosed is a talk & wampum from the Stockbridge Indians to [Chief] Anderson o the cheifs of the Delaware Nation & one from myself. You will read them both to Anderson and his cheifs. You will take their answer down in writing & forward it to unto the Secty. of War. Col. Menard informs me that it is possible [probable?] probable Mr. Souchet [spelling?] will overtake you on the road as you will be with your wagon - if so, and Anderson is not with you, you will hurry on to where he is as an answer to the Stockbridge Indians is required at as early a day as possible. Let me know how the Indians are getting on. What number will move this fall. Gen. Atkinson sent an express a few days ago to Col. Arbuckle ordering him to come a demand to be made of the murders of five Americans. Those Osages are so much in the habit of commiting outrages against the American traders, & citizens passing through their country it will become necessary to punish them as the will is increasing. Dear Sir: I past at the Delawar on James Fork five day[s] ago. All the Delawars Excepte [Chief William] Anderson and five or six Famely [families] have goone to the wood to suporte them self having nor corn nor games near the vilage. Anderson with howm [whom] I have staid three day[s] . . . and fear some Difugullay [difficulty] with the Whites . . . By your orders a years ago Are now returning and have taken their lace howme [home] . . .The Whi [whtes] [say] that the Indians are . . . perhaps little moor than 40 mile East of State boundary Ligne . . .
Ther is at this placetwo very hold [old] men one of them interely [entirely] Being Two Crippled not very hold [old] and Seven old women. Al neked and sytarved the[y] are in the Bound[ary] of the Stae of Messaung [Missouri] . . . Corn his [is] a[t] James Fork $ Per bushall and will be $2 Before . . . one maun [month] the Dallawar have no more . . . Wm. Marshall [has] abat [about] 200 B[ushels]. Giles 150 James Wilson the Interpreter 125 B. The Wea Peooria & Penkeshaw hanot [have not] one Graine of corn for two months past Mr. Lorimer at this Place [h]as 500 B. But it is disposed of. [From] A.L.S. Pierre Menard to: Wm. Clark, Superintendent of Indian Affairs St Louis. 1824 February 15 Mouth of Swan and White R.
Subject: The Delawares have gone to the woods to get subsistence since they have no corn or game near their village. The Peorias, Piankashaws and Weas have also taken to the woods. Nevertheless they are moving in closed to Anderson on James Fork in order to be back at Anderson Village by the 25th or 30th. Will be better able then to give an account of the situation of the Indian. Sir. The Delaware Indians in addition to the places already allotted for trade, wish for their convenience the three forks of White River to be established as one of the points. I will observe that place is without the boundary of Treaty allotted to the Delaware Indians. Yrs. Respectfully R. Graham, U.S. Ind. Agt. Charge 3rd: For giving advice to the Indians contrary from that which the Agent had given. Charge 4th: For contempt of the Government. Specification 1st: Inasmuch as the said Wilson did curse the Govt. of the U.S. when being told that he did not interpret according to the true intent & meaning of the orders of the Government. Specification 1st: The said Wilson did keep and make use of Iron, belonging to the Indians and intended for their use. John Campbell, Sub Indian Agt. Subject: Reports in conformity with Clark's instructions to visit the different Indian hunting camps within the State of Illinois and to urge the Indians to remove to their own lands west of the Mississippi early in the spring. The Potawatomis have been friendly with the whites, but are unwilling to move from their -resent location which is on military bounty lands. The Kickapoos have not yet emigrated. but have caused no complaints to have been made because of their conduct. It is of the opinion that most of the Indians will have to be forced from Illinois, so strong is their attachment to the land of their fathers. The whiskey they obtain so easily is largely confirming them in this stand. The Delawares have been conducting themselves well, but drink to excess and are loathe to leave a place where it is so easily obtained. Recommend prohibiting all trade with the Indians in the State of Illinois after the 1st of June and also preventing them from planting any corn in that state. (Folder 13) From John Campbell to Major Richard Graham. Anderson's Village, James Fork, May 19th 1825. Sir I have this day pointed out a situation for building opposite to Anderson's dwelling, where there is a fine spring and good timber for building. I would advise that the buildings to be built on the plan of Wilson's buildings. I am unable to ascertain what they will cost, but it will be considerably above one hundred dollar. I have had a talk today with [Delaware Chief] Anderson today on the subject of the man hoo [who] is selling Whiskey to the Indians he is much dissatisfied that he is not removed. I should have started down on Sunday but on examining the laws I am not satisfied that my powers extend me fully on this subject and I will attend to it immediately. I think it would be well to write to the proper authority in Arkansas and no [know] wheather those persons have account to squatt without permission on the publick lands. If there can be no way to break this set of horse steelers and whiskey sellers up, we shall have no peace in this nation. The Kickapoos have called again today asking me to visit them. I shall goe and see them soon as Anderson leaves. This Anderson wishes me to write you to mention to Genl. Clark Something about the horse that was taken from his son by the man Anderson took the whiskey from as he cannot get his horse. Please send me some tea by Wilson and dont forget my hat. Be sure to make the arrangements with Col. Menard to bring my trunk and Mattras and the articles in my memorandum, send me paper and quils, Ink powder for Wilson. Track[?] wishes to say to you the number of persons belonging to there family there is twenty souls in all here including Bob hoo are entitled to there share. Inclosed yuo have the list of horses lost by the Dellawares and the evidence persisely as they gave it in. It is more lengthy than is necesary but they would have every particular set down. I should of done it myself, but had no paper and my pen has given out. I wish you would urge the nessisity of having ur buildings put up, for it is very disagreeablbe to have to board with those people. I wish you would write me fully on the subject of those horse thiaves and whiskey sellers. I wish to no wheather I shall be Justifiable in taking some of the Indians with one and forcing those fellows to give up the property belonging to the Indians. Write me all the news and don't forget my letters. Sir. Inclosed you have some documents for your parusal on the subject of hog killing by the Dellawares. The dispute betw Natcoman and Mr. Marshall is not yet settled. Marshall has gone to Cape Herrardoe [Girardeau) for evidence. There is much feeling here amongst the Indians about the manner in which the annuities shall be distributed. The poor Indians complain to me constantly and that that they they in the duration get little or nothing that the big fish eat all the little ones up. There complaints are made by Killbuck's band and very justly so too. I am creditably informed at he Killbuck and his great men have signed receipts to Gillis & Boys [Boyce] for Seventeen hund dollars to be paid out of this annuity. This is for depts. [debts] contracted by Killbuck and a few of his band. By this means the poor of his band are to get nothing. This is unjust and ought not to be suffered. I hope you will inform Col. Menard of this and prevent his excepting those orders of Killbucks. Anderson the Chief Joins me. He is much disatisfied with me in consequence of the corse I have persued to endeavor to stop them frombringing in such quantities of whiskey. Thjere has not been less than three hundred dollars of whiskey brought in the nation by the Indians since you left. This Andersenand myself have called the chiefs and soldiers together several times and I have said everything I could to to atop it but to no purpose. Anderson says we will stop but them goe on and see what will be there fate. You have no conception of the Difficulty I have had undergone since I arrived here. I have not had three days rest since I have been here. I believe I have erected every cabbin on the Dellaware land. I have just returned from a visit to the Peankeshaws and Weas and Peorias. they join me in endeavoring to stop them from bringing in whiskey below. The chief of the Piankeshaws informed me that some of those white people who were permitted to remain on the and by Anderson had brought in whiskey and sold it tot he Indians. I remained and watched them for two days but could not ketch them. On my return I called on Anderson [and] told him that they must leave the land. He called the chief and they councilled together. finally concluded that I should notify those men that if they do soe again they must leave the land immediately but they must have it all wints [wintr?] so soon as them crops were finished. [As clear as mud. Editor] I have visited the Kickapoos frequently, I have made them give up some horses which they had belonging to the whites. I should be glad if the could be anint [another] interpretor for the Kickapoos. I have had that to do myself which is not my duty. They wish someone to visit them on the Osage river which I shall doe as the fires are done. Some Jurion [?] has written to the Kickapoos that they would furnish them goods at a very reduced price for there annuity. They had agreed to take there goods from Col. Menard as they told me themselves. I doe not expect that any body will furnish them lower than Menard. I have now given you a full view of everything worth your attention. Except that I have notified Mr. Wilson that I should not [call] on him again to interprat for me, he is by no means fit for that place, he cannot give the propper interpratation of anything, he will always put his own construction upon what I say to the Indians and what they Indians say to me. This I have caught him at frequently and giving different advise from myself. This Anderson and a great many of them tells me now. They say they thought I would find it out myself. I have do soe to my satisfaction. You can doe as you please. I informed him on the 21st of this month that I should not call on him again. I have spoken to Troyet [?] to act for me for the present. Send me the outlines of the late treaty that I may no the boundary lines. Give my best respects to Govener Clark and family and to Col. Abinander [?] I am much oblige to you for the hat you sent me. Write me by Col. Menard. Send on the newspapers. My Dear Sir, Much excitement has been produced in this vicinity for the last two or three months in consequence of a prevalent rumour that the small settlements of Indians on the borders of the River St. Francis were to be forcibly broken up and their inhabitants removed beyond the White River . . . A correct knowlede of the St. Francis which runs parallel with the Mississipi for upwards of one hunded a[nd] fifty miles on a direct line, and at n place is more than twenty miles from it, is from one extent to the other sunk by earthquakes and filled with timbers which have died and fallen into the water, rendering it unavigable for every species of boats except canoes; the west (or lead) fork as it is termed enters from the high country which divides Black and White river from the tributaries the St. Francis; and from fifty miles from its confluence wit the east fork. has suffered equally, and is equally circumstanced as respects its navigation. An hundred miles above the junction of these two, a bay or bayon [bayou?] (as it is here treed) connect them together. Within the island thus formed; and at a very small elevation abve the level of the water, of the two rivers, spread over an immense surface as it is, by the sinking of the country, live those Indians in three villages. They consist of Shawnees, Delawares, and Muscogees Creeks. It seems as if providence in commiseration of their misfortunes had directed them thither, where white men will not live; and where there is just enough of fish, fowl, and game to minister to their subsistence. without encroaching on the rights of others. In their character UI am happy to bear witness, from two years residence in this neighborhood, that they are inoffensive, useful, and in some degree industrious. They raise good stocks of Horses, cattle, and hogs; and make a sufficiency of bread-stuffs fro home No charge of dishonesty has ever been, even colourably, sustained against them, and the little trade they furnish in furs, peltries, Bears, oils is extremely acceptable to our small community from its vicinity, and the facilities afforded in obtaining it. About three years ago three negroe men owned by George Colbert (a Chickasaw) were forced from his savage cruelty to abandon his service; and betook themselves to these villages They are still there. A. Walker of this County received authority from the son of Colbert to seize them. I was at the villages with him. The Indians did not object to his doing so; but for some cause unknown to me, he declined, and returned without them. In the transition [translation? ], although an eye witness, I could not discover any thing reprehensible in the conduct of the Indians, They say it is a matter between Indians - that n white man is interested; and as it regards the permission given to the negroes to live among them, George Colbert alone is insured and that he, to their knowledge is a cruel unprincipled savage. I have said there's much on this subject, lest improper colouring from motives if reward, or profit, might have been given to it. In the sentiments I have expressed I know the whole community here heartily accord; and if necessary will unite in a petition to the government. It is probable my friend Capt. Lessieur (the oldest inhabitant of this part of the state and a respectable citizen in any country) will also make some statements on the subject You may especially rely on his information and knowledge of the country. Sir I have the honor to enclose to you a statement of the claims of the Delawares for Horses stolen from them on there journey from Indiana to Missouri. These claims do not form and part of those which have already been laid before the Government. . .
Will call on the Delawares for payment for stolen hogs as soon as proof can be obtained against them. Has warned that traders against giving credit on the faith of being paid out of Indian annuities and has lectured the Indians on the justice of unequal distribution of the annuities. Says that "puting a stop to there bringing in whiskey is moreally and physikally impossible." The Kikapoos have left their village for the Red River to make their winter hunt and the Piankeshaws left about the same time. The Delawares are dissatisfied at not receiving their iron as usual and [Chief] Anderson has heard that the Cherokees are planning war. Mentions Delaware Natcoming and Killbuck among others. Encloses Anderson's speech delivered on the murder of his son. Describes the incident of the son waiting behind his party to search for their stolen horses and of never being seen again. Feeling is high against the Osages who are suspected of the deed. Speaks of two interpreters who will receive twenty dollars per month. Asks Graham to send him writing paper and ink powder. Subject: It is gratified his views are approved by the War Department. Met with some difficulty in bringing the Delawares and Shawnees to agree to become friendly with the Osages. Te Kickapoos are pleased with the idea of peace and will readily give their influence to carry it into effect. A small war party f Cherokees have killed a Frenchman and threaten to kill all those who trade with the Osages. Wishes to be instructed as to his power of granting licenses. Has been much pleased with the Delawares who desire to become farmers. They appear to be very industrious. Has furnished them with iron to shoe their horses an they are forced to go great distances for game, laming their horses in the process. (Folder 13) From the United States (Indianan Department To James Pool D.ed. Foy my serving as Blacksmith for the Delaware Indians residing on James Fork of White River for the quarter ending the last day of February 1826 - $500 per annum $125.00. To John Campbell United States Sub Agent at James Fork of White River in the State of Missouri. This is to inform you that the party of Delaware Indians that hunted in the Swamps on the East Fork of this Territory have had three horses stolen by the Whites. . . other Whites that those Band of Indians have hunted near thoz have conducted themselves with uprightness and the most Poticular honest and civility. Received from Richard Graham United States Indian agent the sum of Three Hundred & Sixty Dollars in full for the private annuity due to me for the year 1826 as promised by the courts on the part of the United States, at the Treaty of St. Marys in 1819 as witness my hand seal this day & date above written. [To:] Mr. John Rodney, Deputy Sheriff, Hix Ferry, Lawrence County [?] St. Louis, July 18th 1826. Sir Your letter of date April 2 to Maj. Campbell Sub. Ind. Agent has by him been given to me. In this letter you state that there are three men by the name of Grays who have stolen horses from the Delaware Indians hunting in that neighborhood - that the character of the Indians while hunting was remarked for [appropriateness ? ], honesty, and civility & recommend that these men may be prosecuted. Major R. Graham Sir I write you a short note, giving you my opinion of matters things here. I am satisfied there is too many persons here acting as agents and advisors hoo [sic] are all working for there [sic] own interest. some it appears from indian reports don’t want the Dellewares [sic] to exchange there [sic] lands without the goverment [sic] consent to pay there [sic] debts I suppose to the traders, others want reserves of land made for them; others want pay for there [sic] buildings , some of the persons say if the agents will help them that they will assist the agents in affecting what they wish for the goverment [sic]. all those things combined together has more or less influence upon the mind of the Indians. permit me to further state to you that I think it bad pollicy [sic] to permit the traders to cultivate soe much of the indian soil and to keep such large stocks of horses and cattle in the neighborhood of the villages, and pay the indians no rent and sell them corn at an extravant [sic] price to them the indians have no encouragement to raise corn or stock, some of the traders are now clearing more land. those hoo [sic] have indian families of children I think ought to be allowed to cultivate soil sufficient to support there [sic] children but nothing more. I hope there will be a stop put to this grand imposition as soon as possible, you will very readily perceive from the above remarks from what source they come Indians are not very apt to make those remarks of themselves. I wish you to send me some washington papers by Mr Mitty and letters if any, since I enclosed you my report, Mr William Marshall has lodged a written report against Mr. Wm Gillis for having sent a number of pack horses to the woods with goods to trade with the Indians without license which is the fact, the goods are sent to the three forks of white river, for soon as Gillis arrived from St Genavive [sic] I informed him of Marshalls Report, and that I should hold him accountable for the forthcoming of the goods and ?? untill [sic] I should hear from you on the subject. I hope you will not delay giving me some instructions how to proceed, I wish you to answer my letter fully on the subjects above stated, you have inclosed [sic] Marshall letter. I have sent Col Menard a coppy [sic] of Marshalls letter as he is much interested in this affair. [[Chief] Anderson has called on me and expresses a wish that Mr Gillis may have license to trade on the three forks of white river, this you will be the best judge of yourself. I have permited [sic] Mr Gillis to remain at the three forks of white river untill [sic] I should hear from you as it was the particular wish of Anderson, but he is not to trade any of the goods You have no idea of the high ground this gentlemen takes here he is more than agent. I could say much more to you on this subject but let this suffice for the present, or untill [sic] I see or hear from you, which I hope will be soe soon as you can send me the answer. Did not intend saying so much in this note as I have (??) but this affair of Gillises has compelled me to do so. this leter [sic] is only intended for you and myself. Majr. R. Graham, Saint Louis Dear Sir Your Favor of the 4th instant on the 23th November last. The Shawnees fifteen in number went at the Dellawar's town on James Fork For the purpose of going on Exploring the land near the Kansas Designed for there future and permanent residence. it appears by anderson's letter to me that the Dellawars were also ready to go but that after several Consultations it was agreed amonst them to pospone their Journey untill April next. Mr. Johnson writes to me that he will be here next summer with a large Daputation of Different nations to Explore the countries west of the Mississippi. 27 September 1831. (Folder 23) Abstract of the inventory of merchandise transferred by William Gillis to "Kansas Outfit" in 1830 on the Delaware removal to Kansas. Annual Rural Directory of Christian County Missouri, 1974. -contains maps of townships with residents/owners as of 1974. The Valliere Land Grant. Photo copy, no source. Dekay, Sam & Rod S. Tucker. “The Investigation of an Early Archaic Site in Northern Christian County Missouri.” Ozarks Chapter of the Missouri Archaeological Society Meeting: 03-06-1968. -discussion of lithics at 23CN643. General Highway Map, Christian County Missouri. Missouri State Highway Department, Division of Planning: 07-28-1976. Schoolcraft, Henry Rowe. 1853. -2 photocopied pages of a book (cannot determine the title) referencing the rivers and terrain of region. Tong, Marvin E. “The Indian Heritage of Christian County.” Christian County, Its First One Hundred Years. Christian County Centennial. Mc. Vm Hoffman Press, Jefferson City, MO: 1959. Dowling, Denise. “Trail of Tears State Park, Cape Girardeau County, Missouri.” 10-11-2000. ***Price, James E. “A Gun Repair Tool Kit for The Delaware Indians.” Early American Industries Assn, Inc. Vol. 38, No. 2: June 1985. -list of tools and iron furnished to Delaware Indians, 1822 from B. L. Valle on request of Major R. Grahams, agent. Weatherford, Claudine. 1980. “Trade Bells of the Southern Plateau: Their Use and Occurrence Through Time”. Northeast Anthropological Research Notes 14(1):20-84. Brown, Ian W. “Historic Trade Bells”. In South, Stanley, editor. 1975. The Conference on Historic Site Archaeology Papers. Volume 10, Part 1: “Presented Papers at the Sixteenth Annual Conference, Gainesville, Florida”. Institute of Archaeology and Anthropology, University of South Carolina, Columbia, SC. Melton, Senator Emory. “Delaware Town and the Swan River Trading Post 1822- 1831”. Cassville, Mo: 1977[?]. Carter, Clarence Edwin. “The Territorial Papers of the United States 1819-1825” United States Government Printing Office, Washington D.C.: 1953. “Treaty Signatories”. U.S. Statutes at Large, V. II. -photocopies from 1778-1829. -9/20/1811 letter from Benja. Howard regarding a late council to reconcile the Shawnee and Delawares with the Osage. ******-01/20/1825 letter re theft of horses from Delaware by Osage. -where is this? ***Grimes, Richard S. “The Early Years of the Delaware Indian Experience in Kansas Territory, 1830-1845”. Journal of the West pp. 73-82. Vol. 41, No. 1:2002. Roach, Ruth Hunter. St. Louis Silversmiths. 1967.-description of coin grade silver-notes St. Louis silversmiths had coinage and some bullion to which they added “copper alloy…white metal, and tin, to make the ornaments for the Indian trinket trade…”-p 31 notes payment received from Richard Graham for 100 silver brooches etc. Document- Copy of License to trade at the Three Fork of White River granted to William Gillis 11/04/1827. ***Sandy, Wilda. “William Gilliss c. 1797-1869.” Webpage printout from Kansas City Public Library Special Collections. -brief biography of Gilliss, primarily in regards to K.C. Synopsis of the Litigation over the Estate of William Gilliss. Compiled by Norman & Robertson, Kansas City, Ks: March 1, 1901. Gillis, William: probate records, p 1-46; 1872. -Self, Burl & Ron Smith. Map: “19th Century Missouri Tribes, Treaties, & Indian Removal”. Missouri Ethnic Research Project. No date. “William Clark’s Diary May, 1826-February, 1831”. Ed. Louise Barry The Kansas Historical Quarterly. Vol. XVI, No. 1: 1948. Barry, Louise. “The Beginning of the West.” Annals of the Kansas Gateway to the American West 1540-1854. Topeka, KS: 1972. Farley, Alan W. “The Delaware Indians of Kansas 1829-1867.” Presented to the Kansas City Posse of the Westerners, Grinter House, KC: 1955. ***Harrington, M.R. “Religion and Ceremonies of the Lenape.” Indian Notes and Monographs. Ed. F.W. Hodge. New York: 1921. “Marshall Family-Delaware Town”. From: Grinter and Marshall Families pages. Lenape Mirror web site: 07/21/03. Archaeological Society of New Jersey. Vol. 35. South Orange, NJ: 1978. “A Delaware Indian Symposium” Ed. Herbert C. Kraft. The Pennsylvania Historical and Museum Commission. Harrisburg: 1974. Pp. 57-160. Kinietz, Vernon. “Delaware Culture and Chronology.” Indiana Historical Society. Vol. 3, No. 1. Indianapolis: 1946. Pp. 7-138. “The Lenape Indian a Symposium.” Ed. Herbert C. Kraft. Archaeological Research Center Seton Hall University. South Orange, NJ: 1984. Newcomb, William W. “The Culture and Acculturation of the Delaware Indians.” Anthropological Papers, Museum of Anthropology, University of Michigan. Ann Arbor: 1956. Kraft, Herbert C. “The Lenape Archaeology, History and Ethnography.” New Jersey Historical Society. Newark: 1986. “Native American Cultures in Indiana.” Proceedings of the First Minnetrista Council for Great Lakes Native American Studies. Ed. Ronald Hicks. Muncie, Indiana: 1992. Weslager, C.A. “Lenape Ethnology from William Penn’s Relation of 1683.” Bulletin of the Archaeological Society of Delaware. No. 18, New Series. Delaware: 1985. Holcombe, R.I. “History of Greene County, Missouri 1883.” Chapter 1. InternetDownload from: http://the library.springfield.missouri. 07/02/03. Schoolcraft, Henry. “Historical and Statistical Information Respecting the History, Condition, and Prospects of the Indian Tribes of the United States.” BIA: 1847. ***“Guide to the Microfilm Edition of the Pierre Menard Collection in the Illinois State Historical Library.” Illinois State Historical Society, Springfield, IL: 1972. “Atlas of Great Lakes Indian History.” Ed. Helen Hornbeck Tanner. University of Oklahoma Press. Norman and London. American Indians. Cons. Henry Markowitz. Vol. II. Salem Press, Englewood Cliff, NJ. Pp 430-434. Foreman, Grant. “The Last Trek of the Indians.” Russell & Russell, New York: 1972. Pp. 34-37. “Handbook of American Indians North of Mexico.” Ed. Frederick Webb Hodge.Bureau of American Ethnology, Bulletin 30; part 1. Washington Government Printing Office: 1912. Pp. 385-387. “Volume III Territory of Louisiana, District of Cape Girardeau, Court of Common Pleas, Minutes of the Proceedings 1808-1812.” Cape Girardeau County Archive Center, Jackson, MO: 2003. Pipe tomahawks made from brass, steel, pewter. Many were made by Indians themselves. Discusses methods of manufacture. Includes a long inventory and pictures of many tomahawks in public and private collections. An overview of bead types and methods of manufacture. Lots of color photos. Not very applicable to Delaware Town. Sunder, John E. 1968 Joshua Pilcher Fur Trader and Indian Agent. University of Oklahoma Press, Norman. SMSU F 598.P5 S8 Pilcher took over for Manual Lisa in the fur trade on the Missouri. A lot of the same people and tribes involved. Not directly applicable to Delaware Town. Quimby, Goerge I. 1966 Indian Culture and European Trade Goods. University of Wisconsin Press, madison. SMSU E 78.G7 Q49 Great Lakes area. Good discussions of various types of goods, including silver, brass, bells, bottles, kettles, medals, beads, iron, Jesuit rings, firearms, ammunition, flints, tomahawk pipes, tinkle cones. “The conical tinklers were made of rolled up trapezoidal sections of sheet brass that were fastened to buckskin fringes to give a tinkling sound with motion. The arrowheads were either conical or flat triangular in shape…The brass arrowheads are rare or lacking in the Late Historic period [1760-1820] of the western Great Lakes region” (p. 72). Has pictures of several types of beads. Has a list of silversmiths. Mooney, Michael MacDonald 1975 George Catlin, Letters and Notes on the North American Indians. Clarkson N. Potter, New York. SMSU E 77.C38 I looked at these books to try to find pictures of artifacts and clothing. Catlin was not one for excruciating details, so I was not very successful. There is a short section on early American history, including St. Louis fur traders, Lewis and Clark, Indians on the East Coast (including Delaware). Notable pics of “The Prophet.” Short description of the Delaware “The name of these Indians once carried terror wherever it was heard” (p. 309) and other tribes including Shawnees, etc. Catlin, George 1973 Letters and Notes on the Manners, Customs, and Conditions of the North American Indians, 2 volumes. Dover Publications, New York. SMSU E 77.C38 Very similar to above, but with slightly different form and order. LaFarge, Oliver 1956 A Pictorial History of the American Indian. Crown Publishers, New York. SMSU E 77.L245 A nice series of pictures, from museum dioramas, historical documents, and “modern” photographs. Some of the famous ones that occur in many books, etc. Drawing of Delaware ca. 1800 (p. 81) with silver cone and ball earrings. The Western Delaware are not the ones that had been in Springfield so not directly relevant. Some interesting stories, medicinal customs, and genealogy.